Today's our first time in-person with the 2011 Ford Mustang GT. What's it look like? 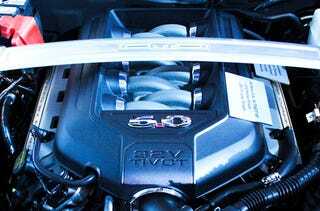 A 'Stang with a 5.0-liter V8 crammed under the hood, just as God intended. 2011 Ford Mustang GT: The 5.0 Is Back! The 5.0 makes 412 HP and 390 Lb-Ft of torque and sends that power through either a 6R80 six-speed auto or an MT82 six-speed manual.